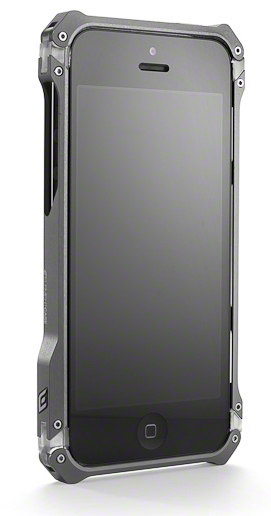 Element Case has secretly announced its latest addition to its iPhone metal case lineup called the Sector 5. This is Element Case's most extreme and over-engineered machined aluminum bumper case yet that features a radical new design. The Sector 5's CNC trussed design is extremely rigid yet lightweight. For the first time, the Sector 5 utilizes a unique multi-link fastening and modular system that claims to enable users to quickly install and remove the case off of their phone using just one screw, while the interesting modular construction will allow for future add-ons and upgrade accessories. The Sector's anodized aluminum is finished off using Element Case's brilliant matte Flux coating in a gun metal grey color. The Sector case will not interfere with the iPhone's reception thanks to its plastic RF bridge insert. It'll include two black and grey Ultrasuede back plate skins and a transit kit. Element Case's new Sector 5 case is available for $140. The harbinger of aluminum iPhone cases, Element Case, has just come out with a new and improved tactical-approved Vapor Pro Elite Black Ops 2 case for the iPhone 4 and 4S. The second iteration brings with it a redesigned Elite aluminum frame coated with military spec type 3 hardened non-glare black coating and a perforated, amber colored RF bridge for unhindered reception performance. The new Vapor Pro Elite Black Ops 2 also features a unique and beveled, true gun grip-style 1911 G10 machined hard back plate exclusively made by veteran firearms grip maker, VZ Grips. Element Case's Vapor Pro Elite Black Ops 2 case is available now for a cool $180. In case you're thinking about getting that awesome VZ Grips 1911 G10 iPhone grip by itself, luckily it's also available separately for $40, and can be applied like a normal skin. We be you thought iPhone 4S and iPhone 4 cases got boring right? How about these latest CNC machined aluminum bumper cases designed by Italian designer Andrea Ponti dubbed the Ag++. Although this looks like another impossibly comfortable to hold Draco IV bumper, the Ag++ was designed to be ergonomic when held and features a beautiful two-tone color scheme that's available in a slew of different colors from glossy to matte finished. The bumper case has a two-piece, slim construction that comes together and ia secured using two hex screws. The Ag++ aluminum bumper case is lined with shock absorbing lining and offers direct access to all ports and buttons , and includes two carbon fiber-like black and silver back skins at $50. Yes it looks pretty, but the company hasn't mentioned whether or not the Ag++ degrades the iPhone's reception being that it's fully made out of metal. Rokform is saying goodbye to its aluminum Rokbed iPhone 4 case for a more appropriate hybrid case called the Rokbed Fuzion. A case with a slider-style design that requires no twisting of any kind of screws, made for both the iPhone 4 and iPhone 4S that's made out of a CNC machined aluminum upper body boasting a rugged look with a slide-on polycarbonate bottom cap that should eliminate all reception degradation. The Rokbed Fuzion will set you back $79, and is now available in a slew of anodized colors. iSkin's first aluminum case isn't what we would call a true aluminum case, but it's close and looks fancy enough. 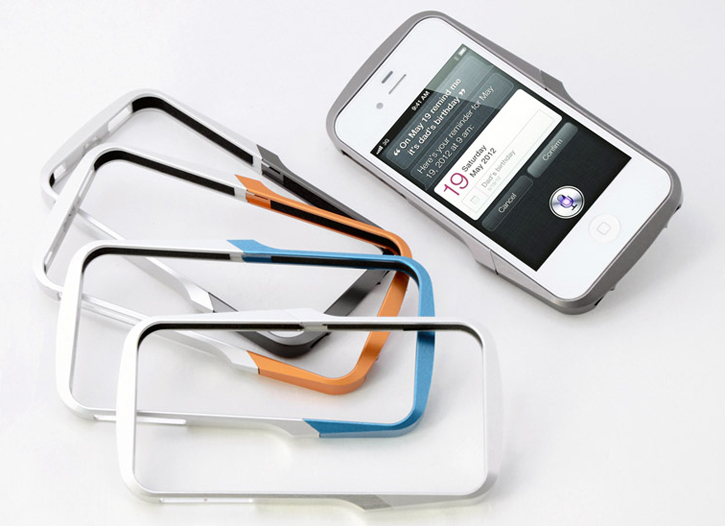 iSkin's new Aura case for the iPhone 4 and iPhone 4S is a dock-friendly, back snap-on thin and slim case with a brushed aluminum back plate. The Aura case is also designed to virtually fit any 3rd party accessory and comes in Silver with a white band, Graphite with a black band and Navy with a black band for $39.99.